Located in the oldest part of the city - overlooking the river Irwell, between St Ann's Square and Victoria Station ? the Manchester Cathedral is a popular tourist attraction with fine stained glass windows, beautiful carvings and a large religious bookshop. The 600-year-old cathedral, which was restored during the Victorian era, still resembles much of the magnificent original medieval architecture. 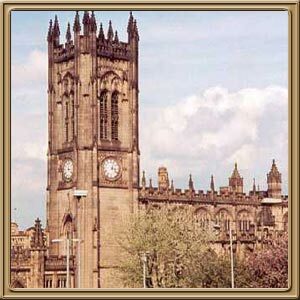 The history of Manchester cathedral goes back to 1421, when Lord of the Manor Thomas de la Warre founded it. Until 1847 it was a collegiate church, which was later elevated to Cathedral status. The cathedral is built in the Perpendicular Gothic style, characterized by its tall windows and flat fan-vaulted ceilings. It was dedicated by Henry Vth to St Mary, St Denys and St George. However, the external appearance is largely a result of 19th century additions. Meanwhile the interior has extensive woodwork in the form of carving carried out by ?Ripon Carvers? between 1485 and 1506. In 1940, the building sustained a direct hit during the Manchester blitz. Many fine windows were lost forever and considerable damage was suffered. Fortunately, much of the woodcarving survived the bombing. The fine choir stalls and misericords (choir seats), which date back to 1500, are worth seeing. On the west side of the cathedral are five modern windows made by Tony Holloway that represent ?St George?, ?St Mary?, ?St Denys?, ?Genesis? and ?Revelations?. The oldest parts of the building are the piers that support the tower. Another interesting feature in the Cathedral is the hanging bridge, a 15th Century Bridge that connected the Mediaeval Town with the Church. Built in 1421, this bridge has been excavated and now finds a place in the Cathedral?s basement restaurant. The site of the Hanging Bridge was built over the Hanging ditch, a natural ditch that connected the rivers Irk and Irwell.